What do you want to be when you grow up? This was, back in the day, a far easier question to answer: you either wanted to do what your mother or father did, or you wanted to teach, just like your favorite school teacher. Or maybe you chose your profession based on what you liked to eat (ice cream!) or based on what vehicle you fancied (firetruck!). Over the past few decades, the question has become more and more difficult to answer, and is almost impossible to answer today–or will be soon. Some people even today seem to comment on this change with a tone of surprise, but we have seen this transition coming. Thanks to automation, robotics, artificial intelligence and machine learning, and thanks to a globalized, connected world where one can do almost any job from anywhere, there has been a fundamental change in how jobs are created, how they are phased out, and along the way, the whole concept of having a career tied to a specific skill set, or the knowledge of a specific tool or piece of equipment has become outdated. As a result, the world that we live in today, the world that we have created for ourselves, is forcing us to ask some very fundamental questions about how we organize as a society, what sustains our economies, how we educate and train the next generation, and more. As we look ahead to this pace of change and evaluate the benefits brought by a host of emerging digital technologies, we also find it worthwhile to look back and study the past. In this series, we will look at obsolete jobs, skills, and careers. What were some lucrative careers back in the day that have become irrelevant today, thanks to technological advances? We’ll review these ‘Jobs of Yore’, partly as a nod to nostalgia, and partly as a way look ahead: what can such changes in the past tell us about our future? And about the future of the next generation? 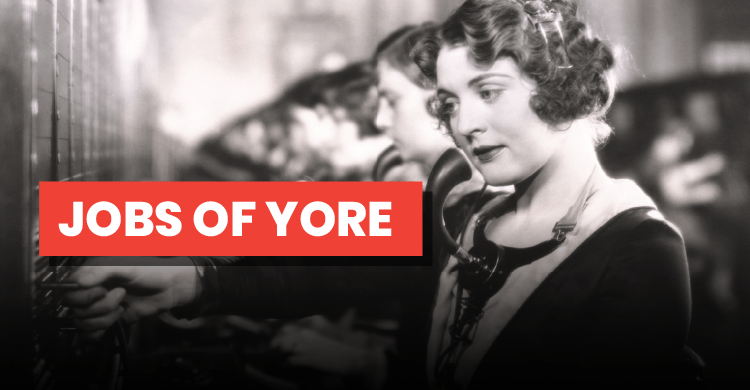 Check out our Jobs of Yore switchboard operator infographic.